Christmas season in Kuching, the capital city of Sarawak is no different from other cities of the world. The Christmas tree figures! This year tHe Spring Shopping Center put up a 46-footer easily making it the tallest and the most well-decorated tree to date. Speaking of modern shoppping centers in Kuching, Plaza Merdeka located in the historical quarters of downtown Kuching opened its door recently 12-12-12; auspicious indeed. For a start, the once quiet enclave of the Sarawak Tourism Complex and India Street's night life will never be the same again. 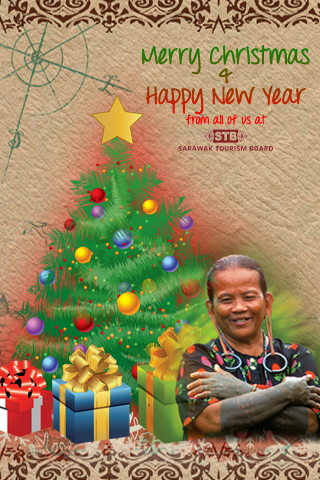 Merry Christmas from all of us at Sarawak Tourism Board. And may the season brings you good tidings and a new year that gives you bountiful offerings. We have discovered a new group of Rafflesia in BUKIT TASAU, KPG LEBOR, GEDONG, SERIAN. The journey to Bukit Tasau takes about 30 or 45 minutes drive from Kuching City to Serian Town, another 30 minutes from Serian Town to the junction of Bukit Tasau foothill (Kpg Lebor). Continued by another 20 minutes drive up to the hill, and trekking to the RAFFLESIA area takes about 25 minutes. The jungle path to the new location of the Rafflesia. Stream along the trekking trail. This is TETROSTIGMA (scientific name), Rafflesia needs this plant to grow. Some of beautiful flora that can to be found there. Rafflesia after more than 2 weeks. Rafflesia after more than 1 week of blooming. Public transportation to Serian Town from Kuching City: Bus No.3A (Sarawak Transport Co. Contact No.082 233576) or Bus No.K3 (City Public Link - Contact No.082 428278/239178). This takes about 1 hour bus ride. Transportation from Kuching City or pick up from Serian Town can be arranged with the representative from the village. For further information on entrance fee, guide fee and possibility of Rafflesia blooming, please contact the representative of the village as mentioned below. Nanga Sumpa has long been a popular destination for that authentic Iban culture (longhouse) experience. Located 1 1/2 hours longboat ride from the Batang Ai Longhouse Resort managed by Hilton, Sri Aman, this isolated village offers wild orang utans spotting and adventure treks. Here LOUISE MURRAY talks about surviving a rainforest trek, backpack et all. The highlight of this trip is the Belanum or locally known as Jelatong – the floating house. What makes it more interesting is because this Belanum is floating on Bakun reservoir – the world’s second tallest concrete rock - filled dam size 695sqKM, about the size of Singapore. So far there’s only one Belanum that caters for visitors which belong to Mr Luhat. This Belanum has 4 rooms that can accommodate from 1 to 4pax per room. It offers great picnic spot and waterfall. This Belanum can carry about 20 people at one time. Equip with 2 bathrooms, 2 toilets, a dining hall and a kitchen; which makes it another perfect gateway for those who want a peaceful holiday gate-away, especially Anglers. Consider ‘heaven’ to the enthusiastic Anglers. Here they may find indigenous species of fish like Ikan Baong (catfish) and if you’re lucky you might fish Semah (one of the most expensive & high demand fish in Sarawak). For non-anglers, you can enjoy a peaceful day by going for a swim or picnic at the nearest river. Jungle trekking or bird watching while cruise at the reservoir is some of the activity that you may enjoy as well. From Bintulu town to Bakun jetty 206 KM (Bakun Dam) will takes approximately 4 hours drive and another 30 to 40 minutes by boat from Bakun jetty to Belanum floating house .It takes about 3 hours to Uma Belor longhouse, 140 KM (from Bintulu town). The northern region of Sarawak is home to the 'Orang Ulu' tribe; a collective name to represent the various ethnic sub-groups. 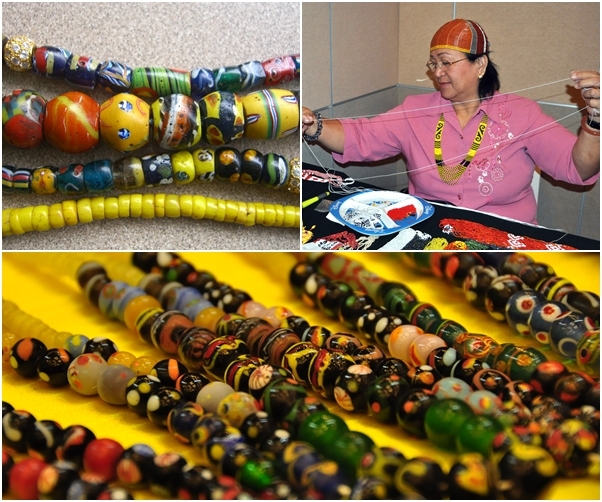 They include the Kelabits, the Lun Bawans, the Berawans and the shy and semi-nomadic Penans. In the region above Kapit and the Pelagus Rapids, the Orang Ulu people literally known as "upriver people", consists of the Kayans, Kenyahs, Kajangs, Lahanans and the Punans. The Kayan sub-group forms the largest among them. 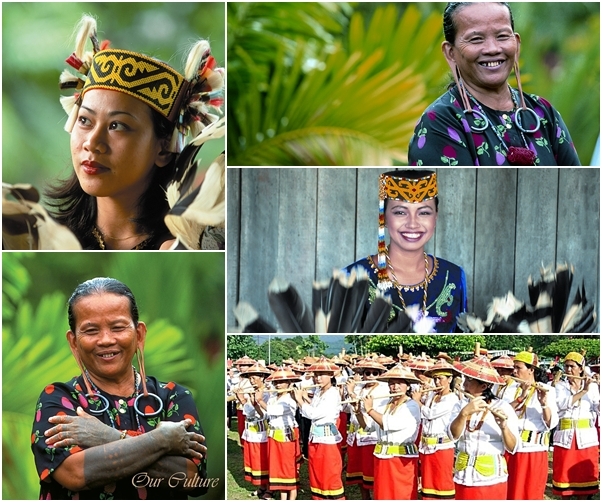 The majority of the Kelabit tribe are found in the Kelabit Highlands. The highland is a series of beautiful mountain valleys lying slightly over 1,000m above sea level and flanked by jungle-covered peaks rising to more than 2,400m. The climate is probably the most pleasant in Sarawak, although it can become quite chilly in the evenings. The Kelabits and the neighbouring and closely-related Lun Bawangs produce the fragrant and much sought-after Bario (Adnan) rice. Both groups are branches of the Orang Ulu, and live in a combination of longhouses and individual units that are widely dispersed throughout the area. They are friendly, hospitable people and enjoy receiving visitors. Bakelalan (formerly Ba’ Kelalan) is a remote settlement, home of the Lun Bawang ethnic group. The village is famous for its apples and organic vegetables, and their musical 'bamboo band'. 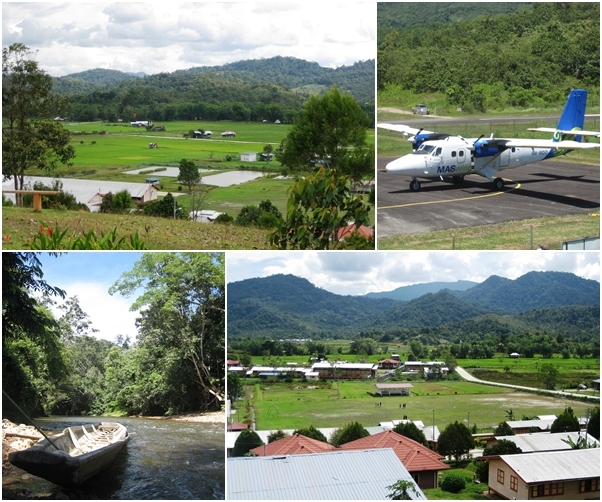 The village is connected to Lawas and Miri by air, and it is also possible to travel there via a combination of existing and old logging roads. There is a hot spring with resort accommodation at Merarap, about 68 km from Lawas town where a pleasant beach, 7-km away at Punang can be found. The Batang (river) Baram, Malaysia’s (and Sarawak’s) second longest river, drains much of the northern region, and also is home to many of the Orang Ulu sub-groups. Much of the Baram region is inaccessible, but there are some fascinating attractions in the region. 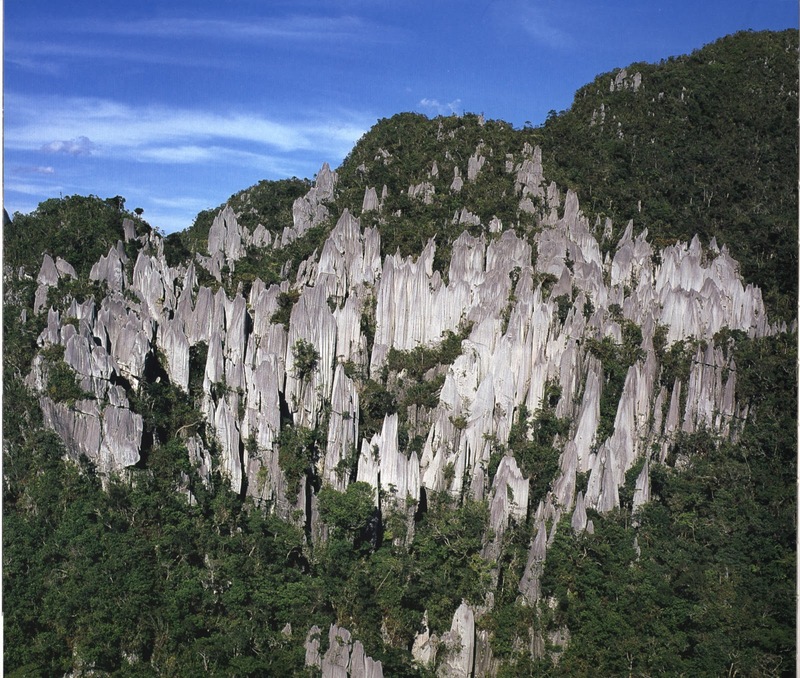 There is the famous Gunung Mulu National Park and the lesser-known Loagan Bunut National Park known for its disappearing lake. Other places of interest to visitors include the small riverside town of Marudi, the bustling Kenyah community at Long San and the delightful Kayan longhouse community of Long Bedian; the amazing Tenyok Rimba waterfall is nearby. Some Kayans in the Sungai Asap Resettlement programme, Belaga (3-hour drive from Bintulu) are involved in homestay programme. They also organise game fishing trips in the Bakun lake; an area the size of Singapore. Like the Ibans, the Orang Ulu are also former head-hunters but they live in even more imposing longhouses than the former. Also, their arts and crafts are very different. The Orang Ulu especially the Kayans and Kenyahs are known for their woodcarving, beadwork, spectacular 'keliring' or totem poles and the music of the hauntingly beautiful lute instrument - the 'sape'. Tattooing and body ornamentation are prominent; older ladies can be recognised by the brass rings hanging from their extended earlobes and from the dense dark tattoos on their arms and legs, a practice that is disappearing from the younger generation. Dabai is one of many exotic fruits in Sarawak. It is commonly known as or-kana - means 'black olive' in Hokkien, but technically it is not an olive. The dabai tree can grow up to 21 meters high and it's furry leaves are thin and its twigs are covered with golden down. A planting distance of 9 meters is recommended. You need to prune the young trees to produce more bushy growth. Dabai trees are dioecious (i.e have separate sexes) with male and female trees required for fruiting! Dabai are white in colour when immature and turn black when ripe. They are oblong in shape like an olive and have thin, edible skin. The yellowish white flesh wraps around a three-angled seed. Soak the dabai in hot water until they are soft. The yellowish flesh tastes creamy. Eating the skin is a personal preference. For taste, try either soy sauce or salt. You can also preserve it just by soaking them with black soy sauce or with coarse salt (without the seed). Dabai fried rice is a specialty dish in Sarawak. However this is a seasonal fruit. The second best thing that comes out from a fruit is the nut inside the seed. Crack it open with a mortar and pestle set; the good old-fashion way. Use a toothpick to remove the nut if necessary. The entire Sibu Central town can be leisurely explore by walking. A number of Sibu's heritage attractions can be discovered within the town proper. This building has witnessed the transformation of Sarawak from a colony of the British to becoming an independent state by forming Malaysia in 1963. Sibu Heritage Centre was the original administration building of Sibu Municipal Council. It was later refurbished as Sibu Heritage centre Museum. Its upper floor houses the Sibu heritage museum. The ground floor is a commercial belt. There is also a space for artwork exhibition. This old mosque of Sibu has been here since 1883.Its first as a wooden structure was built by Tuan Haji Abdul Salam Minangkabau from Indonesia. However, its structure was never changed; its original form remains intact. Rosli Dhoby, born in Sibu, was an active member of one Sibu – based Malay Youth Movement (Gerakan Pemuda Melayu). On 3rd December, 1949 and at the age of 17 years Old, Rosli Dhoby led a group, codenamed the Rukun 13 (the Black Crow group). They set off to assassinate the 2nd Gorvener of Sarawak, Mr. Duncan Steward. Rosli Dhoby and 3 others, namely Morshidi Sidek, Bujang Suntong and Awang Ramli Amit were arrested and hung. They were buried in Kuching on 2nd March, 1950. 46 years later, their remains were exhumed and brought back to Sibu. They were re – buried at this Warriors Memorial Site on 2nd March, 1996. It is located next to the An-Nur Mosque at Jalan Awang Ramli Amit. This oldest Muslim cemetery site was estimated to have buried over 70 Muslims. However, the burial activity was stop during Japanese occupation in 1941. Over time, river bank erosion has caused some severe damages to the site. It was restored in 2003. The two Angsana trees are said to be the temporary “Batu Nisan” or tombstones for one tomb. As most of the original tombstones were washed away, a memorial structure was later erected to commemorate it. Lau King Howe Hospital was built in the 1930’s as the first general hospital Sibu. Its founder, the late Mr. Lau king Howe, donated his personal wealth to set it up. In appreciation, the colonial government named it Lau King Howe Hospital. In 1994, the hospital was moved to a new site at Jalan Oya. Since then, Sibu hospital, with its much bigger capacity and better facilities, has replaced Lau King Howe Hospital. However, the site of Lau King Howe Hospital is preserved and turned into Lau King Howe Memorial Museum. This is made possible with the joint efforts of Lau’s Clan Association, Sibu municipal Council and the Health Department. Eng Ann Tua Pek Kong of Sibu was founded around 1870. From the original wooden structure of a Chinese temple. It was rebuilt in 1897 into Taoist architecture building. Most of its building materials were imported from China including the statue of the host deity, Lord Tua Pek Kong. Like the other Tua Pek Kong temples in Sarawak, Eng Ann Teng Tua Pek Kong temple has met some major fire disasters in Sibu. But it did not suffer any damages. Even the Sibu big fire of March 8, 1928 which destroyed most of surrounding shop houses, left this temple unscathed. Ten minutes by road from the town center, the Sungai Merah Heritage Walk visits the site of the earliest Chinese settlements in Sibu. The pleasant walking trail along the river front (the water is really red, turning to yellow when the tide sets in) leads through a landscaped park to the Wong Nai Siong Memorial Garden, a site honouring the principal founder of Sibu. The Heritage Walk concludes with the James Hoover Memorial Park that commemorates the renowned Methodist missionary and educator who worked with Sibu's pioneering Foochow migrants from 1903 to the 1930s. Take a taxi or Sungei Merah Bus 1A. This square is named after a great Methodist Missionary (from USA), Reverend James Matthew Hoover. Reverend Hoover was the first foreign pastor who served the Methodist Churches of Sibu. From 1903 to 1935, he had helped to build 41 churches and 40 schools all over Sibu. When the Fuzhou settlement pioneer, Mr. Wong Nai Siong, left Sibu in 1904, Rev. Hoover helped to manage the settlement. His contributions to the early development of Sibu were fondly and gratefully recognized. Sibu is the largest port and commercial centre in the Rejang Basin and the gateway to Central Sarawak. Located at the confluence of the Rejang and Igan Rivers, approximately 130 km from the South China Sea, Sibu is a thriving modern town with a vibrant center and a bustling, crowded waterfront. The residents of Sibu are predominantly Foochow Chinese, originating from the Fuzhou region of southern china, and the town is often referred to as New Fuzhou. However Sibu's ethnic mix is as varied as anywhere else in Borneo, with smaller proportions of other Chinese dialect groups - as well as Malays, Melanaus, Ibans and Orang Ulus - making the town their home. Sibu is easily accessible by road from all parts of Sarawak. Direct air links connect Sibu to Kuala Lumpur and the major towns and cities in Sarawak and Sabah. Take a quick look around Kuching and you will certainly notice a historic building or site, stately and unique, enchanting always; these are just some of the attractive charms of the city. Singularly or clustered, these fascinating cultural and historic icons are found at almost every turn and step you take around the city. The 2-hour (approx.) route introduces visitors to the historical precinct of old Kuching city, where featured buildings are closely located to each other. 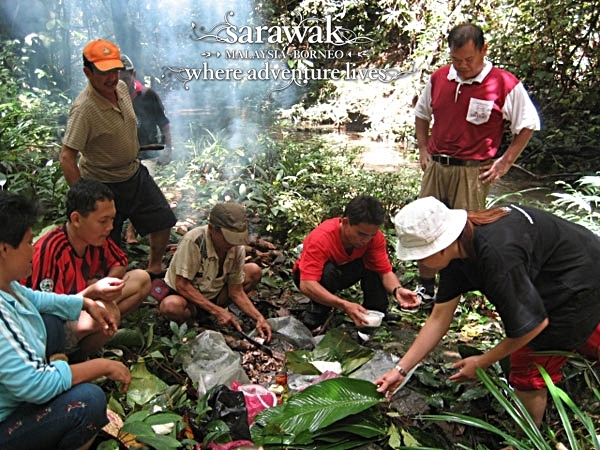 Visitors may join the trail at any point along the Route, but are strongly encouraged to begin at the Sarawak Tourism Complex where the trail map of this self-guided walking tour can be obtained as well as useful brochures of the city, state and country can be obtained. Conservation of the Old Kuching Courthouse of Adaptive Re-use as Sarawak Tourism Complex was completed in 2003. The project won several national awards for conservation. Descriptive plaques mounted on the individual block provide detailed historical information of the building. The Old Kuching Courthouse is the first Brooke era administrative building which housed all the government functions under one roof. This building, originally used as the medical headquarter, was one of the first public buildings of more than 2 stories high. Built with concrete frames and supported by bakau (mangrove timber) piling, it also had a concrete flat roof where occupants used to lounge and watch the setting sun, as fondly recalled through numerous writings of that era. The building had been conserved and is currently used by the Museum Department as their Textile Museum. This temple was believed to have been built by the Chinese migrants from Kalimantan, Indonesia. In the olden days, this temple overlooked the mouth of the Kuching stream which ran between the temple and the Old Chinese Court (present Chinese History Museum), to the Sarawak River. Numerous additions and renovation works had been done over the original structure. The dominant dragon frieze was added to the retaining wall in the early 1980s. There are two other temples in that area which are Guan Thian Siang Ti Temple (1889) and Kueh Seng Onn Temple (1895). Both located along the Carpenter Street. Declared open in 1912 by Rajah Charles Brooke, this single storey building was originally used by the Chinese community as a court to administer the laws and customs on marriage, divorce and probate. The Chinese court was dissolved in 1921. The Chinese Chamber of Commerce formed in 1930, used it as their office until 1990. Since 1993, the Sarawak Museum had set up its Chinese History Museum here, with interactive displays that traced the history of Chinese settlement in Sarawak and the contributions made for the development of Sarawak by the respective dialectal group. Fronting the Sarawak River, the Main Bazaar carries the distinction of being one of the oldest streets of Kuching. Now, it is often referred to as an 'antique arcade' not only because of its old-fashioned facades but also for the variety of antiques and handicrafts outlets found here. This romantic structure standing across the river in its regal splendour was the private residence of the Rajah Charles Brooke, which was built as a bridal gift to his beloved wife, the Ranee Margeret. Before the Astana was built on this site, James Brooke's first residence was called 'The Grove', which was later replaced by "the Government House' after a fire in 1857. THE KUCHING WATERFRONT has undergone several transformations since 9th century, from a small settlement of modest ‘atap’ buildings, to a busy port with warehouses and wharves, and to the landscape riverside walk it is today. During the days of the Rajahs and the British colonials, boats would berth along the Sarawak River waterfront, lined with godowns, custom offices and markets. Travelers and cargo alike would embark and disembark at the wharves, making the waterfront a hive of activity during its glory days. This is where the Sarawak Regatta is held annually. Sarawak Regatta has been a premier event with a distinct historical and cultural significant. The tradition of holding the annual Regatta in the Sarawak River continued through the colonial period and into the post-Malaysia period. Completed about the same time as the Fort Margherita in 1879, both forts served as sentry posts on each side of the Sarawak River. Built next to the first Kuching Prison (1877, demolished c.1930s), it served as a maximum-security detention centre. Adjacent to the Square Tower, is the landing point called Pengkalan Batu, where the Rajahs disembarked from the Astana to attend to administrative matters at the Old Kuching Courthouse. The Square Tower, which was later, converted to a dancing hall used by the Brooke’s officers and servants during most of the weekends when they were in Kuching. In its early days the majority of traders here were Indian migrants involved in trading textiles, brassware, spices and market goods. Today it is flanked by century old shophouses, where some had been renovated with modern designs. It used to be congested with vehicles loading and unloading wares before it was converted into a pedestrian mall in late 1980s. Still supplying textile and spices to the general population of Kuching, it is also lined with shops that supplies daily provisions, food and clothes stores with every available space stacked to the fullest. Imagine yourself, an adventurer who wish to spend a day on jungle trekking, dipping in waterfalls, sighting of insects, wildlife and plants; but not having enough time to do so! How frustrated that can be, right?! For that, Lambir Hills National Park, located in the northern region of Sarawak, is the ideal place for you - a nature lover dream-come-true experience. Walk to the longest and toughest (within LNP) trail to the top of Bukit Lambir (465 metres) with a superb view of the rainforest. A 22-metres high tree tower gives you a close-up view of the life of the rainforest canopy, especially its birds. The famous 'Latak' waterfall cascades from the Lambir Hills, forming a large pool that are pleasant to swim after a hot trek. There are a series of smaller waterfalls such as the Pantu and Nibong waterfall along the Pantu trail and Pancur, Tengkorong and the Dinding waterfall along the Bakam trail. 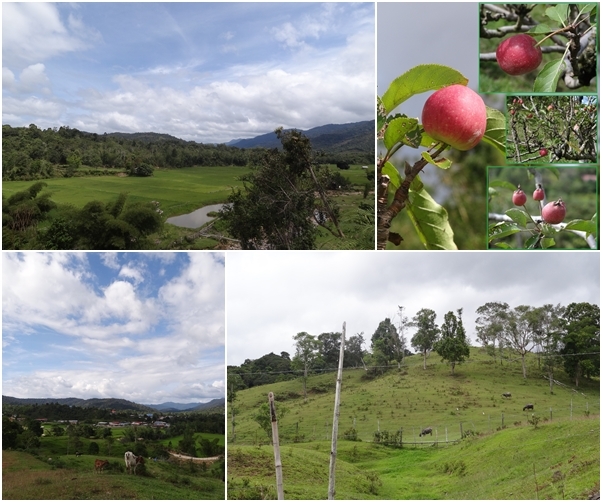 Recognized as the world’s most ecologically diverse area where in just 52 hectares of the park’s 7.000 hectares, 1,050 different species of tree, each supporting 1,200 species of insect life were recorded. More than half of the park is covered with rich mixed dipterocarp forest where huge, tall dipterocarp trees such as Kapur, Meranti, Kempas and Selangan Batu can be marveled at. Other forest types found are kerangas forest with smaller and shorter tress like rhu bukit and selunsur bukit, lower shrub, pitcher plants and orchids. Being only 30-km (about 30-40mins drive) away from Miri City, connected by the sealed Miri-Bintulu road, the Park is easily accessible by public transport. From Pujut Corner bus terminal, visitors can get onto the commercial bus that head for (Miri-Bintulu road). A longhouse made entirely out of ‘belian’ wood. This the first thing that strikes a visitor upon entering the longhouse is how well standing the place is. Rumah (house) Nyuka was built in 1955 and the durability of the wood species certainly reflects its reputation. Another is the tinsel-like atmosphere inside it. Tinseltown? Tinselhouse? :-) Anyway, there is a certain 'green' message to this effort though. You see, all plastic stuff brought into the area are recycled and turned into permanent decorative stringers. Gives one the impression that it is Christmas throughout the year, doesn't it? So where is it? It is located at Lubuk Lemba, Ulu Sarikei and 17 KM from Bayong junction (Betong/Sarikei highway). The nearest major town is Sibu, about 85-km away. This longhouse can be reached by land and on a good road condition at that. For a change, travelling for a longhouse experience does not involve river travel. The scenic roller-coaster ride along the crest of the hills can be a fun experience. There are 300 people from 45 families in this longhouse. Most of them reside in another row of longhouse behind the house proper thus giving visitors a space for themselves. It is the first homestay program operator approved by Ministry of Tourism Malaysia in the Sarikei Division. The place can get quite chilly in the early morning, since it is located in a hilly region of the Sarikei Division. Another layer of long-sleeve shirt should give enough protection. But if you wish to challenge yourself, an early morning bath in the river should do wonders for your skin. Sungai (river) Ulu Sarikei that flows right past the front of Rumah Nyuka. The caveat here is that the river may not be that clear after a continuous down pour. Nature's way of ridding excesses? Enough space for visitors to have their own ... space! A solid looking bench made of 'belian' ironwood which probably needs 2-3 persons to lift it. But there's more to Rumah Nyuka than the physical structure itself. How about being a rubber tapper for a morning? Wake up at 5am, tap, collect and then process them into sheets for drying. For fruit lovers, the best time to visit is November to December. Go 'dabai' collecting; a fruit popularly known as local olives. Or combine trekking with swimming at the two waterfalls in the vicinity. The fun part is stomping the latex block into manageable thickness with your bare feet so that the solidified latex can be rolled through the mangle . Sg Pau waterfall, 30 minutes walk from the longhouse. 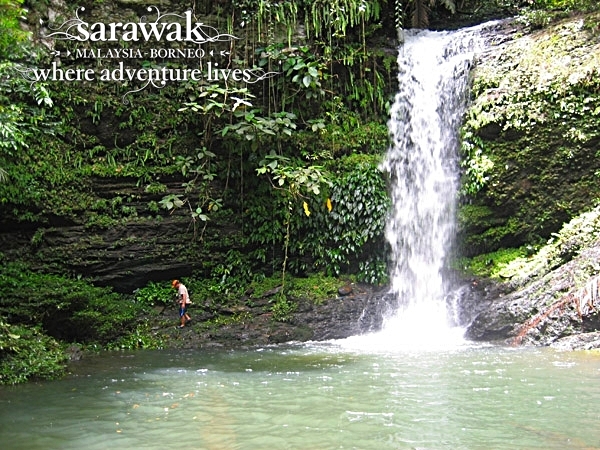 The fitter ones will get rewarded with the majesty of the 5-storey Sg Munsoh waterfall; an hour's walk away. You can take private transport (car/van) from Sarikei town to this longhouse and the charge is not more than RM10 per person / one way. They journey will take approximately 40 minutes. Sarikei is the transit point for the sea-going passenger boat plying Kuching - Sibu on a daily basis.